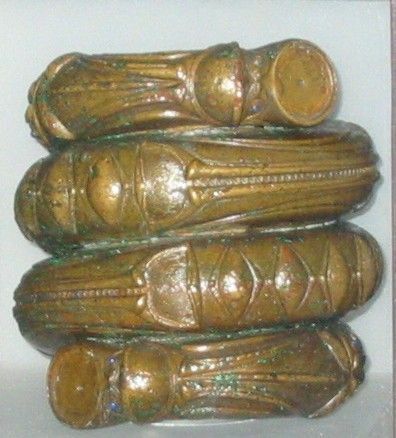 This bronze armring was found at Culbin Sands between Nairn and Findhorn, and dates to the first centuries BC. It depicts a coiled double-headed snake whose eyes are created with blue glass. It was cast in straight rods, decorated in part with ribbing or grooves, with animal heads at the ends. The rods were then coiled into spirals. Eight bracelets of this type are known, all but one from Scotland, with most of these from the north-east. A similar, but much more worn, example was found in peat at Duntulm on Skye. These bracelets would have been worn to show power and status, though whether they were for men or women remains a matter of speculation. Some believe that the spiral bracelets were worn by women, whereas the so-called massive metalwork armlets, such as that from Achavrail in Sutherland, are bigger, and therefore attributed to men. Many other high status objects from the Iron Age and other periods were found at Culbin Sands. Both the Culbin Sands and Duntulm armrings are in the National Museums of Scotland in Edinburgh. This object featured in ARCH’s Display the Past project which looked at the archaeology of Culbin Sands in 2011.